Men, when it comes to buying that new pair of sneakers or a formal pair of shoes, we got you and your sole covered. 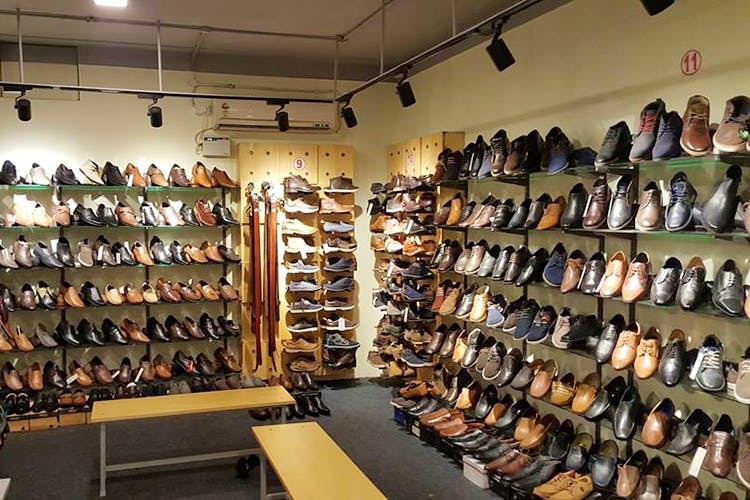 These shoe stores for men in Koramangala stock up on sneakers, boat shoes, sandals, boots, and formal wear such as Oxfords, brogues, wingtips and rounded tips. And the best part is whether you are lacing up for work or brunch, these will cost you just under INR 2,000. The store is Koramangala’s haven for export surplus sneakers, sandals, casual wear, and formal wear. They offer deep discounts and you can pick up Puma, Adidas, and Nike sneakers and sportswear well under the INR 2,000 mark. Just note that the collection isn’t the latest but hey, we don’t think anyone’s going to mind that as long as you get something cool and cheap. They stock up on a lot of non-branded boat shoes and floaters that start at INR 500, be sure to pick up a pair or two for your brunch dates. Loafers, sandals, and flip-flops for anyone who likes casual wear. If you hunt well, you will find Oxfords, round toes, winged toes, and brogues that fit the budget. If you are lucky, you can even score formal wear from brands such as Ted Baker and Clarks. Primarily an export surplus store that stocks up on branded apparel for men and women, they are a quite a collection of men’s (and ladies) footwear as well. Run of the mill brands such as Puma for the staple for sneakers that come in blue, red, and green as well as black. You might even get your hands on skateboarding and basketball shoes if the stocks are in your favour. There’s plenty of non-branded Chelsea boots, trekking boots, formal wear designs such as winged and round toes for you to pick up. Look out for their high boots as well, which we hear is a hot-favourite amongst bikers. Leather shoes are available too, but some of them are well above the INR 2,000 mark. Sandals, loafers, and flip-flops complete the collection. If you are looking for leather shoes that weather, this nondescript store is you need to head to. They do plenty of leather boots that all you biking folks, as well as boot lovers, will love to have. We spotted quite a lot of boots that are low, mid and high ankle and look very military-like. These are priced around INR 1,200 and can go higher depending on the design. There are plenty of loafers and formal wear to pick up too and you will get the both in interesting shades of red, blue and even yellow. The store stocks up on other leather accessories such as jackets and satchels that you can consider picking up if you want a #OOTD that’s all about leather.